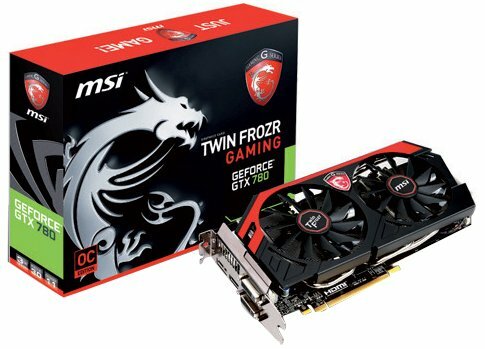 Overclockers UK have had a new batch of MSI GTX 780 graphics cards in stock. You can pick up one for £179.99 + £10 Shipping. The new GeForce GTX 780 is all about hyper-realistic gaming and next generation technology. The GeForce GTX 780 features the same record-breaking GK110 GPU used in GeForce GTX TITAN. The massively powerful NVIDIA Kepler based GPU contains 50% more cores than its GTX 680 predecessor AND comes with 3GB of high-speed GDDR5 and NVIDIA GPU Boost 2.0 technology. GeForce GTX 780's 384-bit memory interface provides up to 288.4GB/sec of peak memory bandwidth to the GPU. All this combines to give you over a 40% gaming performance upgrade. You can get FREE SHIPPING if you are a forum member of the Overclockers forum.